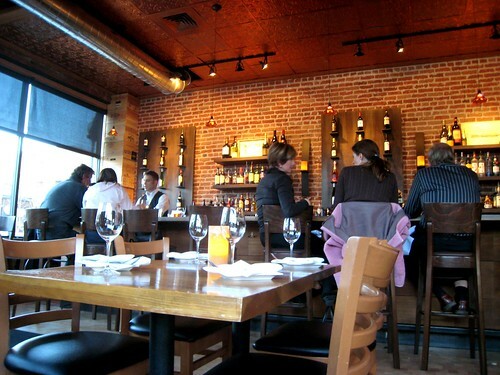 Ototo Den is the newest of a set of long-established Denver restaurants that also includes Izakaya Den, a self-described "sake house with tapas," and Sushi Den, one of the city's most popular sushi restaurants, all of which I'd been hearing about for a while. It so happened that I was in town the week that the three restaurants were pledging to donate a portion of their dinner sales toward Japan relief efforts, and it seemed like a good time to finally give the place a try. ES had heard that Ototo Den was offering ramen, and as the night was chilly we drove to Pearl Street especially eager for big, steamy bowls of noodles and soup. Unfortunately, when we sat down and opened up the menu there was no such bowl to be found. A query to the server revealed that the restaurant had decided to revise their offerings and decided ramen didn't fit in. He suggested that we have some snacks at Ototo Den while happy hour was still on, and then walk across the street to Sushi Den, where ramen was still being prepared. Ototo Den has a great happy hour list, with both food and drink at a good discount, and I was totally fine with that plan. We ordered a number of small plates, not knowing exactly how much food we would end up with, but figuring that we couldn't get that full just off of appetizers. The foie gras terrine came out first, drizzled with marinated beetroot cubes and microgreens and accompanied by grilled triangles of chewy bread. 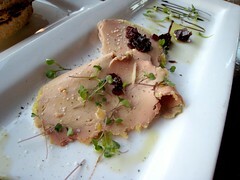 For five bucks this was an ample amount, and the sweetness of the beets set off the rich creaminess of the duck liver beautifully. 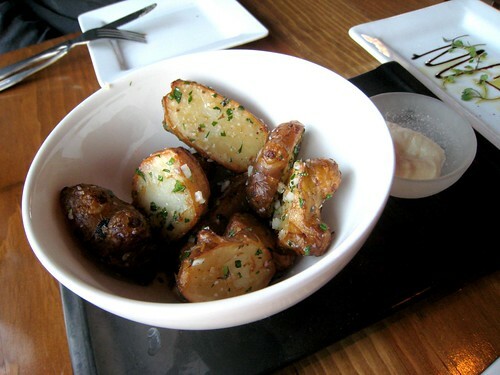 Roasted sunchokes with aioli were wonderful too, the preparation bringing out the tuber's gentle sweetness and lightly crunchy texture, not quite potato and not quite water chestnut. A coating of garlic and parsley finished the dish, and the aioli was a nice touch. We'd ordered all of the three skewers that were on the happy hour menu, and they came out at once. 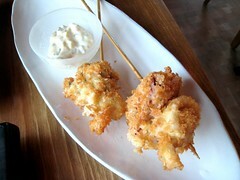 I didn't get to try the oyster skewer, but the single bite of panko-crusted calamari I had was tender and perfectly fried. I liked the charred shishito peppers and fat shiitake mushrooms too—each bite was earthy, intensely smoky, almost bitter. 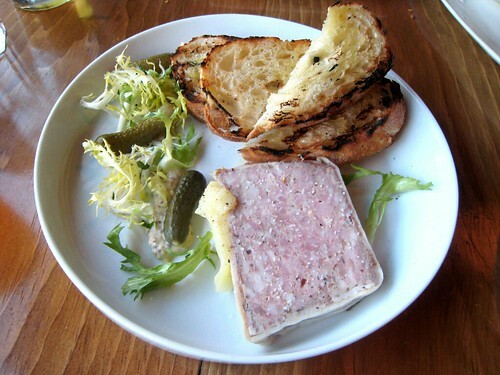 The last thing we'd ordered was the country pate, which came out with more grilled bread and accompaniments of grainy mustard, greens, and cornichons. You can't really tell in this photo, but this was a fairly large slab—maybe a few centimeters thick and a little bigger than the size of a playing card deck. 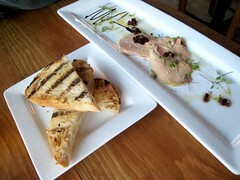 This is definitely a hearty appetizer, especially at the same price as the foie gras terrine. Both of us were getting full at this point, but we'd had our hearts set on ramen all along, and so even after all that food somehow it wasn't a question that we would still head over to Sushi Den. Though there was a busy crowd that night, we were seated at the sushi bar after only about twenty minutes. 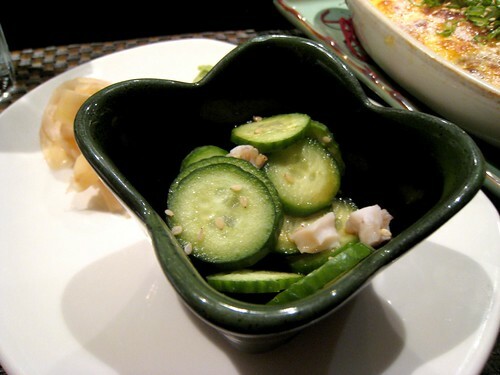 Hot hand towels and water were set down before us, as well as little bowls of a refreshing cucumber and squid salad. But wait! There was udon on the menu, but again, no sign of ramen. We flagged down a server and once more made an inquiry, and his reply? To try Ototo Den, "because they're still serving it." ES and I shook our heads and, with sadness, filled in our server on the situation. No matter. Since we were already sitting we figured there were other intriguing items to try, including the Dynamite, which ES checked off on the sushi bar menu immediately, explaining that he orders this appetizer every time. Shrimp, button mushrooms, and tiny scallops blanketed in a thick, creamy layer of broiled mayonnaise—sure, what's not to love? The richness of the dish made eating too much of it at once a little bit sickening, but it was nonetheless a trashily delicious indulgence. 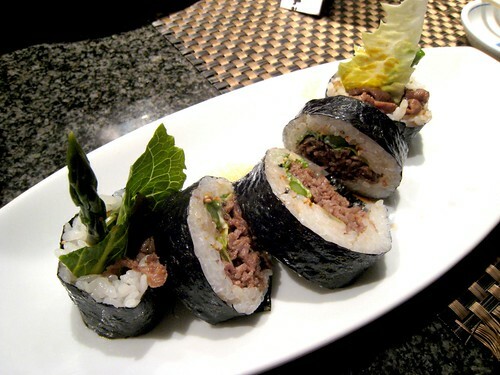 The meat in the Kobe Beef Roll, paired with lettuce, asparagus, mayo, and a sprinkling of shichimi, was thinly sliced, marinated in a sweet soy-based sauce, and tasted exactly like Korean bulgogi. While it was good, it really wasn't all that special—the beef could have been any beef, and the roll was hastily constructed and already unraveling when it reached us. 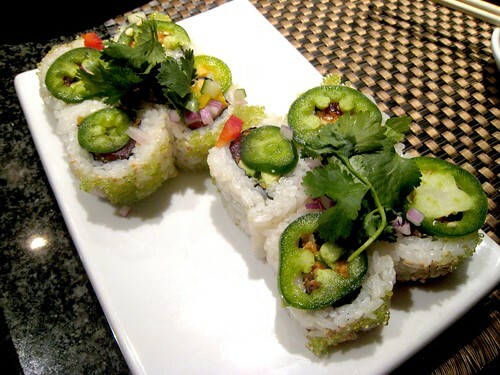 Better was the Tuna Firecracker Roll, filled with tuna, avocado, and cucumber and paved with wasabi tobiko, and then topped with cilantro, shallots, and slices of raw jalapeno. Normally I'm not a fan of fusion-y Japanese food like this, but something about the flavors really worked, with the jalapeno adding freshness, crunch, and heat. I admired the rice, too, which was perfectly done—each warm grain flavorful and distinct but also melding together with the ingredients to create a tasty mouthful. By now we'd eaten so much food I was about to burst, but nonetheless out came the "new style" salmon roll, where the raw fish had been quickly passed through hot oil seasoned with ginger and scallion—just enough to warm up the fish and lightly cook the outside. 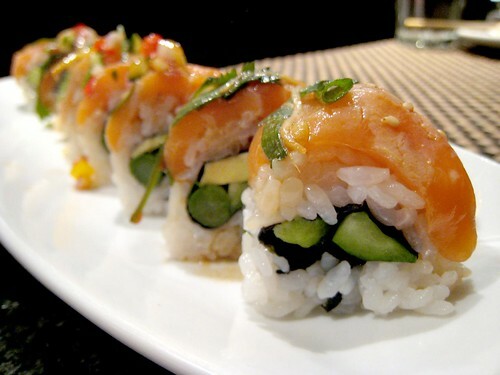 These tender pieces arrived draped over a roll that held asparagus, cucumber, and avocado, and I really enjoyed the interplay of textures and temperatures in each bite. Thankfully, that was the end of our meal. Somehow ES and I had managed to consume two dinners in one evening, our brains believing that because each plate had been so small, and that so many had been billed as appetizers, we hadn't eaten as much as we really had. Our groaning bellies told the truth, though, and though we'd had no ramen that night, we'd definitely had plenty else to satisfy, and how. 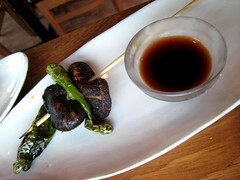 When you have a chance, try Izakaya Den. I like them best of the three. Kitt, yes! 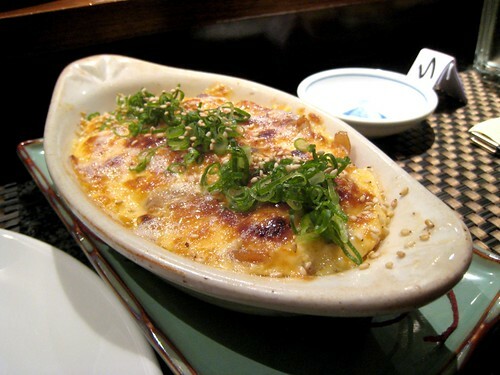 I have been wanting to try Izakaya Den too. Any particular recommendations for what to eat there?